SRHYTHM focuses on noise cancelling and wireless technologies and is dedicated to providing high quality headsets. We have been the noise cancelling technology provider to famous headphones brands for more than a decade, and now we are moving on to providing the best products to the end-customer directly. SRHYTHM products have been through sound quality tests and is supported by our professional teams, including product technical information and after-sale support. Each product comes with a 12 Months Quality Warranty and 24-hour online customer service, and customers can enjoy our products without worry. SRHYTHM provides all the best to our customers. 【Vector Flow Technology】Srhythm headphones have vector flow technology this means the vent hole in the back cavity of the headphones can exhaust gas which affects sound quality,so the front and back cavity air pressure balance and the headphones can output deep powerful bass for the best user experience. 【Never Power Off 】NC-25 not only a Bluetooth headset, but also a wired headset! Built-in 360mAh battery won't allow your headphones power off, you can enjoy your world without noise for 12 hours' long time. ( Don't need to worry the power shortage problem on the long travel ); Wired: When run out of battery use the included cable, you can still enjoy favorite music. 【Portable and Comfortable Material】Only 180g ! And can be folded into the compact size,very convenient for your travel, with the additional storage bag that we offer ,best gifts for family or friends! Material: Rubber Finish(Unlike those plastics, Rubber Finish will be comfortable with your hand touch ), Protein Leather(Skin Protein headband top and earpads with 90° swiveling earcups), Alloy. 【Device Support and Unique Design】Compatible with All Bluetooth Devices !!! 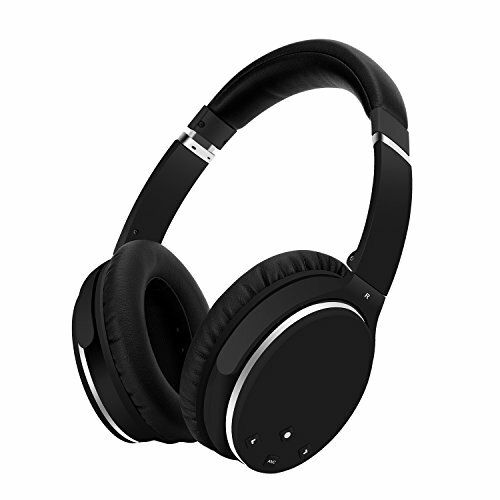 Super sound quality delivered by built-in Bluetooth 4.1 CSR 8635, Operation Distance Up to 10m (30 Feet ).Srhythm have an oval over ear design,Adjustable Headband adapts to All Head Sizes! For a comfortable wearing experience and also to stop audio from leaking and to strengthen the sound field. If you have any questions about this product by Srhythm, contact us by completing and submitting the form below. If you are looking for a specif part number, please include it with your message.